Near the end of February we noted pessimism was being exhibited by both individual and institutional investors. In addition to this pessimistic view of the market, we noted some economic data was looking more favorable and combined, higher equity prices could result in the weeks ahead. True to form investors took advantage of the market pullback and added to their equity positions and the market has moved higher for five straight weeks. At the time of that post, the NAAIM Exposure Index was reported at 31.65. 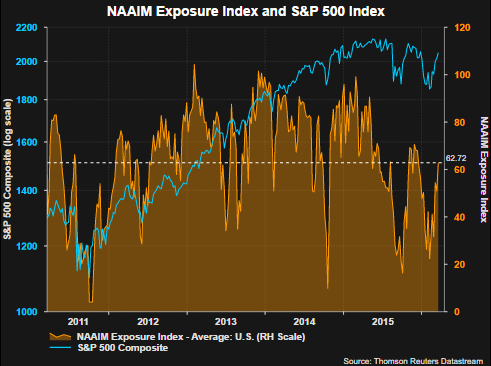 This past week's exposure index reading came in at 62.72 and notes NAAIM member firms have increased long equity exposure. Interestingly, individuals continue to indicate a low level of bullish investor sentiment as reported by the American Association of Individual Investors. This is a contrarian indicator and leads one to believe individuals are skeptical about the market's recent advance. On the other hand, Better Investing Magazine tracks the voluntary reporting of most active stock transactions of its members. 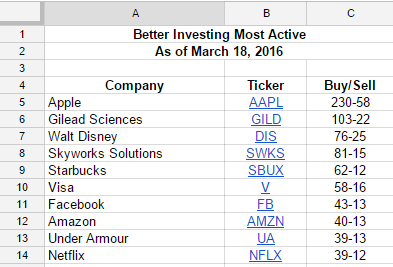 The below list shows the current ten most active stocks. New additions to the list since my last report on this at the end of December are Facebook (FB), Amazon (AMZN) and Netflix (NFLX). These three stocks are apart of the frequently cited basket of FANG stocks. 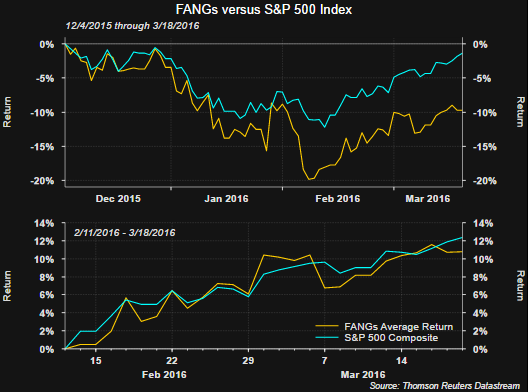 The FANGs strong returns in 2015 were a key reason the S&P 500 Index was able to generate a small positive return last year. If there is anything these three stocks have in common today though it is the fact they trade at high multiples of price to earnings. Certainly investors may find the stocks attractive given their pullback since peaking in December last year; however, the fact Better Investing members find these attractive is a 'risk on' mind set in my view. 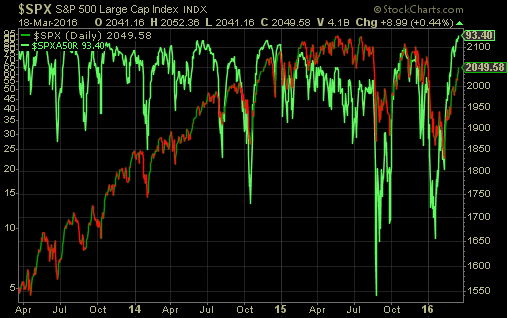 And a look at one last sentiment variable, the 21 day moving average of the equity put/call ratio. 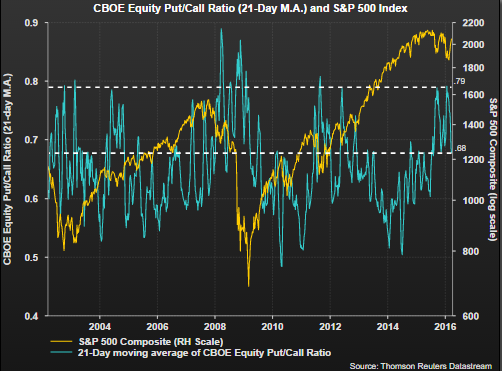 At the end of January, the average of the put/call ratio peaked at .79 after reaching .60 in June last year. A downward trend in the 21-day M.A. is generally associated with higher equity prices and after its January peak this has been the case. One should not look at anyone factor in determining the potential direction of the market. However, sentiment measures in January and February were decidedly bearish. Of potential concern near term is the short term over bought level of the market. The below chart shows 93% of S&P 500 stocks are trading above their 50-day moving average. This is the highest level reached in the last three years. Contributing to this high percentage is the fact many index stocks were in a sustained downtrend that pulled their 50 day moving averages down. 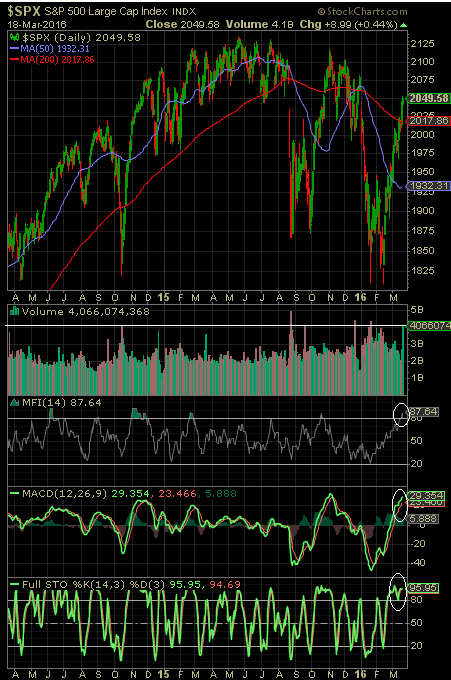 The three technical indicators in the below chart, the Money Flow Index, MACD indicator and the Stochastic indicator are all at levels indicative of a near term overbought market as well. Of importance for investors is the fact the market likes to prove the consensus wrong. In other words the market tends to climb the proverbial wall of worry. There might be much not to like about this market, of which the biggest might be the lack of earnings growth. However, if the earnings weakness is centered in energy/material related segments, and companies see stability in this area. future earnings just might not be as weak as investors expect. The recent weakness in the US Dollar should also provide some relief to multinational company earnings. And given the market's strong returns over the last five weeks, it appears investors are not doing as they say. Although they indicate a lack of bullishness, their actions seem to be speaking louder.